It has been a while I know. We have been so very busy transitioning to the coast and I am still in school for another month. Last weekend we made the big move and moved just about all of our household goods up to the North Coast of Oregon. We are presently camping out in a little apartment in Talent, Oregon just a few miles up the road from Ashland. 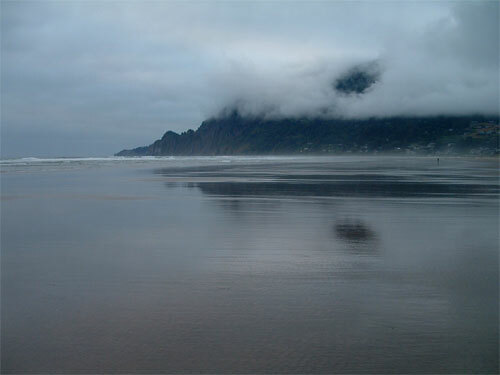 This time next month I will be blogging from Manzanita. Hooray! The move has been quite tiring. We go up again next weekend to do a bit more unpacking and escape from the heat. Our poor dog Twill is a bit bewildered with all this moving around but we still go see her friends at the dog park. School has been amazing. If it was anything less than excellent, we would have been long gone. As I mentioned before, me and the only other student in my first year class are painting casts in grizialle. 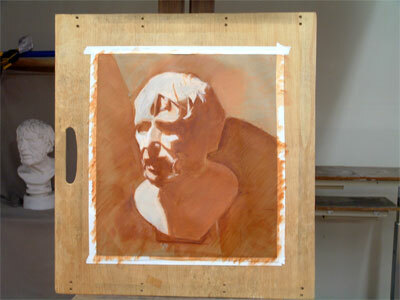 Here is a picture on the last one in progress. It is finished, that is, we are through working on it and I have to bring the final result from school to photograph it. I also have a completed model drawing to share but I just realized that it is at the other end of the state at the moment. I will try to remember to photograph it on our next trip. The best part of school for me is that as soon as we shifted to painting and the techniques required to paint in this manner a door opened. Suddenly I can see what I need to see much better and my drawing and painting accuracy has improved by leaps and bounds. The shift from line to shapes/mass was profound for me. That is very exciting! So we are in the final month of school now. The atmosphere is still intense but there is also a sense of reaching out to the future and letting go of the past. We are all getting ready to go in different directions, some to continue on to Maui, some to go elsewhere, and some to stay here a while. I have a saying posted above my desk, well, I had a saying. It stated, "Let go of the Ledge"
I must admit that seems quite appropriate at the moment. 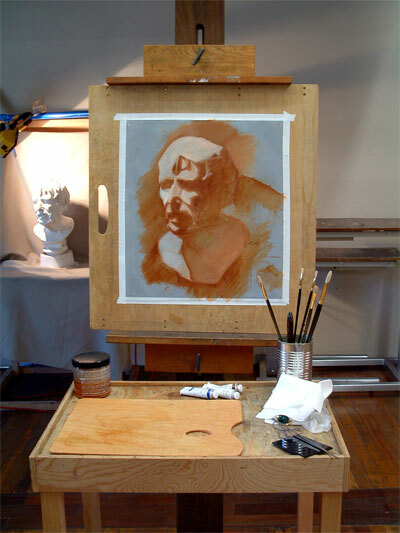 When I arrived here, I was confident that I would be spending four years here studying to be an artist. Now I am moving in a slight tangent and I am not as sure of where I will be three years from now. I know that I will continue my studies and have set up the time and space to do just that. I just am not as sure as to where they will lead (are we ever really sure?)! So, I guess I will just have to "Let go to the Ledge" and see where I land. I will have more to post as school winds down. At the moment I will leave you all with a picture of our new hometown area. This is what I see when I walk four blocks west from our new house! I just linked to you from "Run Like a Girl"--my MIL was an artist who started painting later in her life. I am a somewhat lapsed weaver (after about 35 years). When I can figure out how to do it, I'll send you a link to a gallery of MIL's art, which my husband has set up, 22 years after her death. (We are the mother and late grandmother of Run Like a Girl.) MIL was a prairie artist, and only now are we taking the opportunity to look at her art with perspective. I look forward to following your journey! Hi grannypurple! I love your screen name. I am sure you will be able to pick up your weaving rhythm again, sort of like riding a bike but in the weaving world, there are lots more interesting yarns then there used to be. I am sure you will have fun. 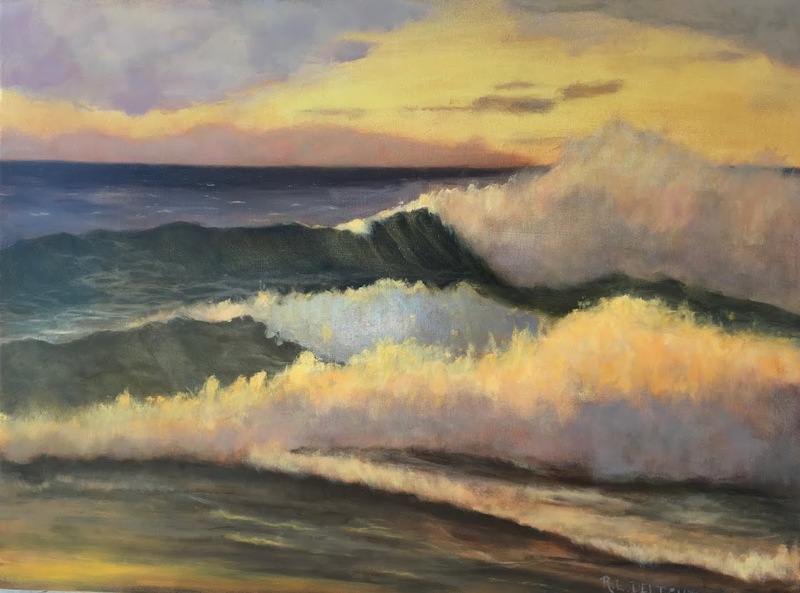 I would love the link to your MIL's art. I have just taken up running and found your daughter's blog. I do enjoy reading blogs when I have the chance. Thanks for the comment!